Great idea! Never got into M. Bison, though. 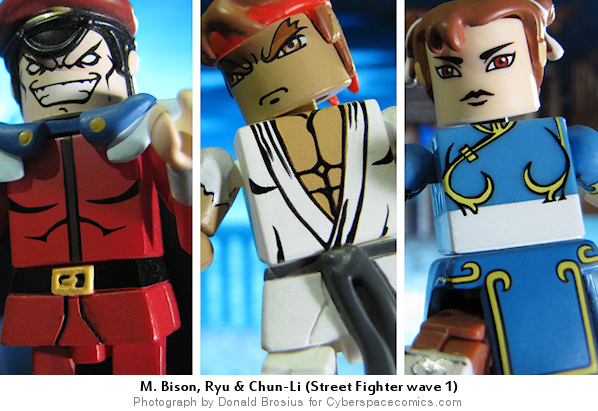 Ken, Ryu, Blanka and E. Honda were my champs. Art Asylum’s mistake with this license is debated, but the two biggest theories are that a limited venue (Toys R Us carried it for a short time, but burried them in an obscure part of the store) and a weird selection of characters is what killed the line. The odd decision with the character selection was that they mixed another game (Darkstalkers) into the mix. Then the second wave didn’t really introduce any new characters – they simply repainted the same characters and called them “player 2” versions (the only new figure we got in wave 2 was Akuma).